BOOT CAMP: In an article from 2007, I learned that captive-born lemurs were trained at the Duke University Lemur Center for introduction into their natural habitat, 5,000 acres of rainforest in Betampona Reserve in northeastern Madagascar. 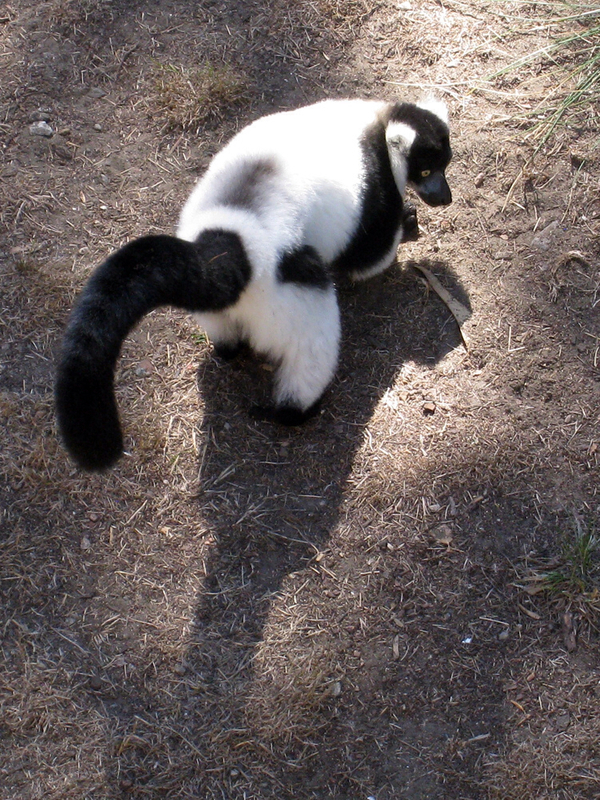 In the first wave in 1997, 3 black and white ruffed lemurs were transported to the island and, before being released, were held in special enclosures that surrounded them with the sights and sounds of the forest while they received a decreasing amount of their normal food (bananas, mangoes, pineapple, and monkey chow) and an increasing amount of the wild forest fruit they would soon be searching out. Before being released in the second wave in 1998, and the third wave in 2001, the animals were given natural forest training at the Lemur Center at Duke referred to as "boot camp." Of the 13 introduced into the wild, 10 survived more than a year, producing between them 6 youngsters, and 3 have survived more than 10 years. Research scientist Charlie Welch and his wife Andrea Katz of the Duke center conclude, "Our losses would have been higher if we hadn't had a team monitoring them so closely. Reintroductions are very complicated, and high loss rates are unfortunately the norm. However, when balanced with what we learned about reintroduction methods, the genetic contribution of the new animals, and with the present level of protection of the reserve, we feel that the project has been a success."